Known from KEK Mama! This festive Mama - daughter bracelets combine shiny white pearls, light pink flowers and a sweet hearts charm. Beautiful armbandenset to symbolically confirm your band! Magnificent (.925) silver Mother & Daughter & Granddaughter bracelets; made of real silver. Each piece wrapped in silk jewelry pouches, nice to give. What will you shine together! These bracelets are special for three generations, designed to symbolize that you love each other very much tad. Made from the finest quality pearls, Swarovski crystals and silver rings. Cute! Special for three generations, beautiful bracelets made of shiny AAA-quality bright white pearls, twinkling light pink Swarovski crystal and silver rings. The hearts symbolize your special bond! These bracelets are true ceremonial pieces: Glistening ivory white shell beads, white Swarovski crystals and silver stars sparkle towards you. Beautiful by its simplicity. what you will shine together! The love between generations forever! Let this be reflected in this true ceremonial pieces: Glittering ivory pearls, Swarovski crystals and a sweet charm with two intertwined hearts. Symbolic of your band. 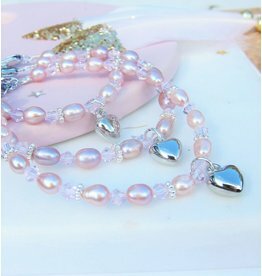 Beautiful bracelets made of shiny AAA quality lavender pink pearls, twinkling light pink crystal and silver rings. On the bracelets hang two convex hearts, symbolizing your family band!